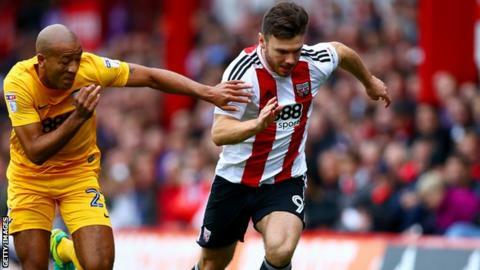 Scott Hogan scored a hat-trick as Brentford grabbed four goals in the last 15 minutes to thrash Preston. The striker broke free of the visiting defence for his first, showing composure to find the bottom corner. Eoin Doyle's flick was tipped on to the post for Preston, but Harlee Dean drove home a second and Marnick Vermijl's injury meant Preston ended with 10 men. That allowed Hogan to round the keeper to net his second, and he completed his treble after Chris Humphrey's own goal. Brentford's victory lifts them into the play-off positions, while the Lilywhites are now only a point above the bottom three. Humphrey's own goal came from a Joshua Clarke cross - his attempted clearance going into the net. Meanwhile, Hogan, who now has 13 goals in 16 Championship appearances for the Bees, completed his treble after running into the channel and striking into the top corner. Brentford manager Dean Smith: "I thought we started both halves slowly. There was a little bit of me that thought that might happen because of the Villa game in midweek. "We looked tired but we grew into both halves and started to play our game. "He (Harlee Dean) was magnificent and gave a real captain's display. He led by example, won his headers, was good on the ball and drive us on in the first half when we looked a little languid at times." Preston boss Simon Grayson: "We started well and were on top, created good chances and counter attacked well and then Brentford scored against the run of play. "We started positively but then they scored their second and it bred a lack of responsibility through the team. From then on it was a kamikaze performance. "You have to play with your head and not your heart but we bombed on looking to get back into it when we didn't need to. At that point it's all about players taking responsibility on the pitch." Match ends, Brentford 5, Preston North End 0. Second Half ends, Brentford 5, Preston North End 0. Foul by Josh McEachran (Brentford). Aiden McGeady (Preston North End) wins a free kick on the right wing. Offside, Brentford. Ryan Woods tries a through ball, but Scott Hogan is caught offside. Goal! Brentford 5, Preston North End 0. Scott Hogan (Brentford) left footed shot from the centre of the box to the top left corner. Assisted by Lewis MacLeod. Own Goal by Chris Humphrey, Preston North End. Brentford 4, Preston North End 0. Goal! Brentford 3, Preston North End 0. Scott Hogan (Brentford) right footed shot from the right side of the box to the bottom left corner. Marnick Vermijl went off injured after Preston North End had used all subs. Delay in match Marnick Vermijl (Preston North End) because of an injury. Substitution, Brentford. Josh Clarke replaces Sullay Kaikai. Chris Humphrey (Preston North End) is shown the yellow card for a bad foul. Yoann Barbet (Brentford) wins a free kick on the left wing. Attempt missed. Simon Makienok (Preston North End) left footed shot from the centre of the box misses to the right. Assisted by Daniel Johnson with a cross. Foul by Scott Hogan (Brentford). Alex Baptiste (Preston North End) wins a free kick in the defensive half. Corner, Brentford. Conceded by Marnick Vermijl. Substitution, Preston North End. Chris Humphrey replaces Eoin Doyle. Substitution, Brentford. Yoann Barbet replaces Andreas Bjelland. Attempt blocked. Aiden McGeady (Preston North End) right footed shot from the centre of the box is blocked. Assisted by Eoin Doyle with a headed pass. Goal! Brentford 2, Preston North End 0. Harlee Dean (Brentford) right footed shot from the centre of the box to the bottom right corner. Assisted by Andreas Bjelland following a corner. Corner, Brentford. Conceded by Alex Baptiste. Corner, Preston North End. Conceded by Maxime Colin. Attempt missed. Callum Robinson (Preston North End) right footed shot from outside the box is high and wide to the right. Assisted by Eoin Doyle. Substitution, Preston North End. Daniel Johnson replaces Jordan Hugill. Substitution, Preston North End. Simon Makienok replaces Alan Browne. Attempt missed. Sullay Kaikai (Brentford) left footed shot from the left side of the box misses to the right. Assisted by Romaine Sawyers with a through ball. Attempt saved. Harlee Dean (Brentford) header from the centre of the box is saved in the top centre of the goal. Assisted by Lewis MacLeod with a cross. Greg Cunningham (Preston North End) is shown the yellow card. Corner, Brentford. Conceded by Greg Cunningham. Substitution, Brentford. Josh McEachran replaces Nico Yennaris. Sullay Kaikai (Brentford) wins a free kick in the attacking half.